Analyses of expression quantitative trait loci (eQTL), genomic loci that contribute to variation in genetic expression levels, are essential to understanding the mechanisms of human disease. These studies identify regulators of gene expression as either cis-acting factors that regulate nearby genes, or trans-acting factors that affect unlinked genes through various functions. Traditional eQTL studies treat expression as a quantitative trait and associate it with genetic variation. This approach has identified many loci involved in the genetic regulation of common, complex diseases. Standard eQTL methods are limited in power and accuracy by several phenomena common to genomic datasets. First, the correlation structure of genetic variation in the genome, known as linkage disequilibrium (LD), limits the ability of these methods to differentiate between the regulatory variant and neighboring variants that are in LD. Second, like other quantitative traits, the total expression of a gene is influenced by multiple genetic and environmental factors. The effect size for any given variant is therefore small, and standard methods require a large sample size to identify the effect. ASE example and corresponding mathematical representation of three individuals (1, 2, 3). We assume that the third SNP is the causal SNP site affecting the differential gene expression level (Allele A/ Allele T). Our forthcoming paper in Genetics presents a new method that improves the accuracy and computational power of eQTL mapping with incorporation of allele specific expression (ASE) analysis. Our novel method uses genome sequencing, alongside measurements of ASE from RNA-seq data, to identify cis-acting regulatory variants. In standard eQTLs studies, the analysis of ASE is influenced by LD structure and the amount of allelic heterogeneity present in the genome. Individual effects appear weak since the effect of a variant is modest when compared to the variance of total expression. In our approach, the genotypes of each single individual with ASE provides information useful to determining variants causal for the observed ASE. Our approach actually leverages the relationship between LD and variant identification to map the variants affecting expression. Thus, analysis of ASE is advantageous over analysis of total expression levels, the standard approach to eQTL mapping. We demonstrate the utility of our method by analyzing RNA-seq data from 77 unrelated northern and western European individuals (CEU). To map each gene, we simultaneously compare ASE measurements across a set of sequenced individuals. We then identify genetic variants that are in proximity to those genes and capable of explaining observed patterns of ASE. Here, we characterize the efficacy of this method as the ratio termed “reduction rate” and denoted as the ratio between the number of candidate regulatory SNPs to the total number of SNPs in the proximal region of the gene. When applied to the CEU dataset, our method reduced the set of candidate SNPs from ten to two (a reduction rate of 80%). Allowing for one error increases the number of candidate SNPs to five and decreases the reduction rate to 50%. We also observe that the relationship between LD and variant identification has a different quality in ASE mapping when compared to eQTL studies, and produces different types of information useful to eQTL mapping studies. ASE studies are a powerful approach to identifying associations between genetic variation and gene expression. Accurate measurement of ASE can identify cis-acting regulatory variants associated with common diseases. Our novel method for ASE mapping is based on a robust and computationally efficient non-parametric approach, and we hope it advances our understanding of functional risk alleles and facilitates development of new hypotheses for the causes and treatment of common diseases. In: Genetics, 2016, ISSN: 1943-2631. 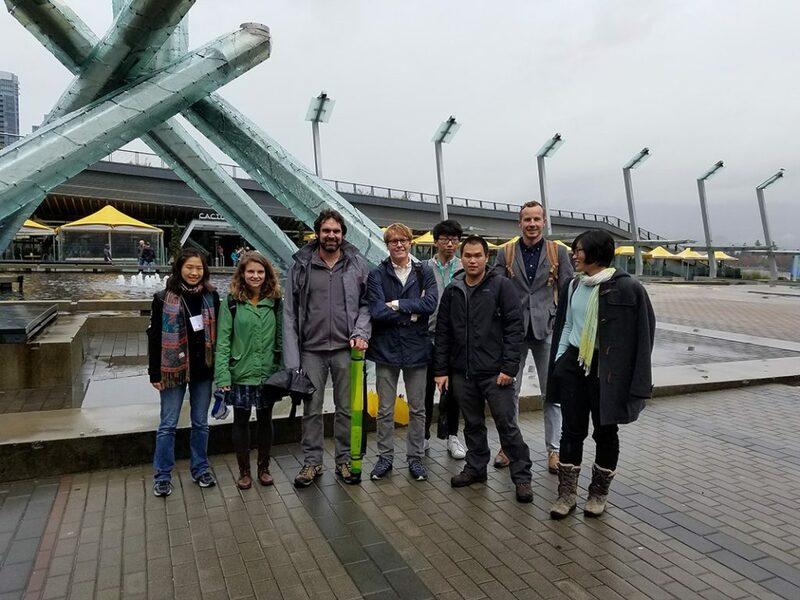 Our group developed a novel method for detecting eGenes, the genes whose expression levels are associated with variation at a particular genetic variant. Identification of eGenes is increasingly important to studies of expression quantitative trait loci (eQTLs), the genetic variants that affect gene expression. Mapped eGenes help guide eQTL studies of complex human disease. However, standard approaches cannot efficiently detect these complex features in today’s large genomic datasets. Func-eGene, which we describe and test in a recent Bioinformatics paper, significantly increases the statistical power of existing association study methods and detects more eGenes in comparison to standard approaches. 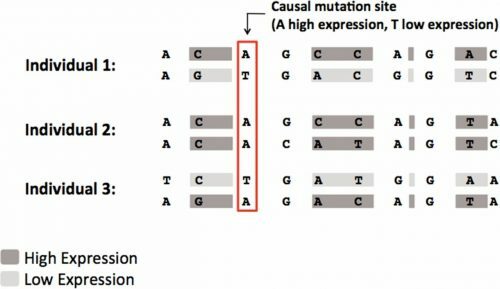 Standard statistical methods for classifying a gene as an eGene first perform association testing at all variants near the gene of interest, then use a permutation test to conduct multiple-testing correction for results. The permutation test effectively corrects for potential biases introduced by multiple testing and obtains a p value for each gene. However, the permutation test is computationally inefficient when processing the increasingly large sample sizes of today’s eQTL datasets and has become a computational bottleneck in eQTL studies. Our new approach, Func-eGene, incorporates genomic annotation of variants to improve the computing power of eQTL studies. Variants located near gene transcription sites (TSSs), or near some histone modifications, often regulate gene expression. Standard approaches do not consider genomic annotations, but we found that annotation of these variants can help locate and associate more causal variants using less time and computing power. In order to do this, we expand upon the standard multithreshold association test that specifies different significance thresholds for each variant when correcting for multiple testing. Func-eGene increases power by assigning lower significance thresholds to variants that are likely to contribute to gene expression. However, this association test still depends on the time-consuming permutation test and requires a known prior based on annotation for genetic variants. Func-eGene avoids these difficulties by reducing runtime and selecting an appropriate prior. To reduce runtime, we replace the permutation test with the Mvn-sampling procedure described in Sul et al. (2015). To find an appropriate prior, we run a grid search over possible sets of scores assigned to annotation categories. Func-eGene then seeks a set of scores that maximizes the number of eGenes and uses a cross-validation strategy to avoid data re-use and over-fitting. Thus, there are two ways to apply Func-eGene to eQTL data. Permutation Func-eGene uses the traditional permutation test to calculate the null density of the observed statistic, whereas Mvn Func-eGene relies on the Mvn-sampling procedure. We applied our method to the liver Genotype-Tissue Expression (GTEx) dataset. We used genomic annotations of the following variants: distance from TSSs, DNase hypersensitivity sites, and six histone modifications. Notably, the distance from TSS annotation detected the highest number of candidate eGenes; using this annotation, our new method discovered 50% more candidate eGenes when compared to the standard permutation method. Our simulations show that Func-eGene successfully control the rate of false-positive associations when using either the permutation or the Mvn procedure. However, implementing Func-eGene with a traditional permutation test is inefficient. Instead, we can obtain the same results with considerably faster runtime when using Mvn sampling. In: Bioinformatics, 32 (12), pp. i156-i163, 2016, ISSN: 1367-4811.